Fated Mates, Incorporated- The premiere dating service company. They promise to find that perfect someone within three pairings. Liz stepped into the waiting room for Fated Mates, Inc with trepidation. Driven to the dating service by her meddling family, she walks in hoping for something but expecting nothing. What she received was a chance encounter with a hunky tattooed man. Julian 'Byte' Marks happens to be interviewing for his first date assignment as well. A building-wide power failure causes a lockdown that throws them together and the sparks fly. If you want to have just a short little read that is only 24 Pages then this is your book. I saw the cover and knew it had to be something that I just had to read. With a title like this and having a place called Fated Mates, Incorporated, I thought it might be a werewolf book. This was far from the truth but still very interesting. I’m not sure that I would go there and go through what Liz and Byte go through. I might be just a liitle mad but everything seems to work out in the end. This is one steamy little read and it will leave you wanting more. I can say that this author really has an imagination. With a mind like this I will be reading more. Alicia prides herself on the chocolate confections she creates. But running her own business leaves her lonely. When someone pays for a month's services from Fated Mates, Inc. she can't pass up the opportunity and waits impatiently for her first match to contact her. When Justin walks into her store, Sweet Success, she can't help but melt like the finest of Belgian chocolates. Chad 'Chopper' Deiter walks into Samantha's physical therapy office with acute pain in his shoulder. She can't help but trip over her own feet and tongue each time she sees him. All that leather and denim sets her heart racing. When Sam shows up for her first Fated Mates date and Chopper rolls in on his motorcycle she nearly faints. What's she supposed to do? Blow off her dating service setup or the man she's been eyeing for months? As one of the techs for Fated Mates, Inc., Casey Michaels leaps into action when the entire virtual system fails. Working for the dating company is rewarding and fun until there's a problem. Of the two-legged variety. 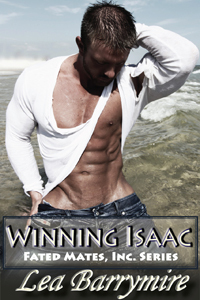 When Isaac Steffens, the man she’s been lusting and crushing over, walks into her office to help she can barely keep her hands to herself. The suggestion to test the interview programs has her panicking, but how can she tell him she’s afraid to let the system record her reaction to him? The surprise he planned for her will get her geeky heart pumping. Perhaps even Fated Mates employees find their ‘happy ever after’.